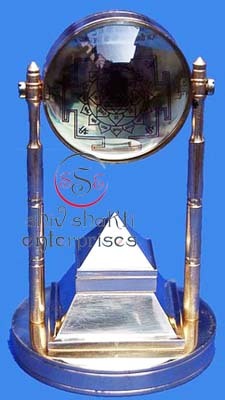 This polished Vastu Pyramid Yantra is made of brass with fine quality. The size of this yantra is 1" X 1". This religious auspicious Vastu Pyramid Yantra is made of Panchdhatu. 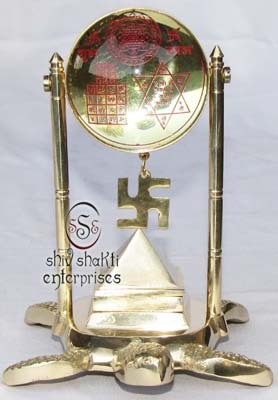 This polished Vastu Pyramid Yantra is made of brass with fine quality. The size of this yantra is 2" X 2". Tortoise Pillar contains Shree yatra at the top, Swastik Yantra in the Middle, 91 pyramid set in lower middle & tortoise at the bottom. This yantra is 5" high. Vedic Vastu Swastik Pyramid is in 5" X 5" size. Pyramids are made very sharp with pointed tips. Very good yantra for vastu remedies. Panchdhatu Tortoise Business Yantra﻿.This yantra at your office table, house, factory, in front of your eyes.This business yantra removes all negative effects and provide positive rays surroundings around you. We manufacture 2d shree yantra, made of metal with gold plated. 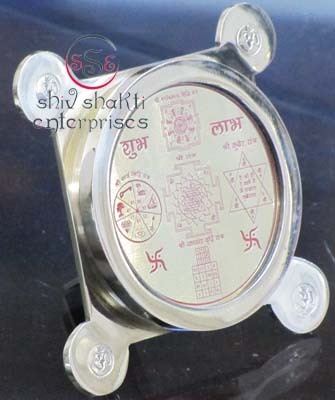 Fine quality shree yantra﻿.